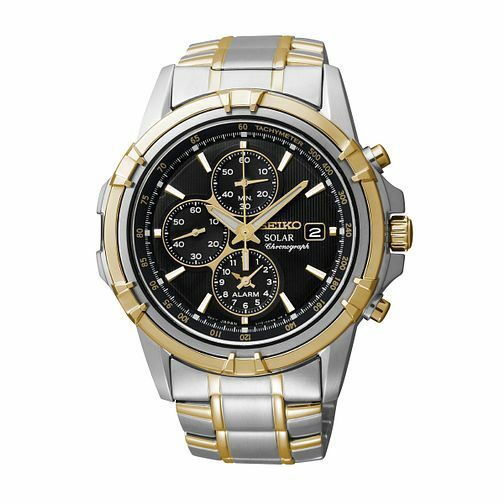 Seiko delivers contemporary sport-inspired style with this two tone stainless steel bracelet watch for men. With a bold structure and distinctive black chronograph dial, the Seiko Solar is powered by both artificial and natural light sources. Seiko Solar Men's Two Tone Bracelet Watch is rated 5.0 out of 5 by 2. Rated 5 out of 5 by Anonymous from Lovely watch I bought this watch as a Christmas present for my husband and it's now over 2 years old, it still keeps the time perfectly. It's a very smart looking watch, he loves it, and gets lots of comments on it. H Samuel have been fabulous with adding and removing links due to weight changes. Husband definitely recommends this watch. Rated 5 out of 5 by Anonymous from Excellent service Very friendly helpful efficient staff :) who made the experience both enjoyable and memorable.